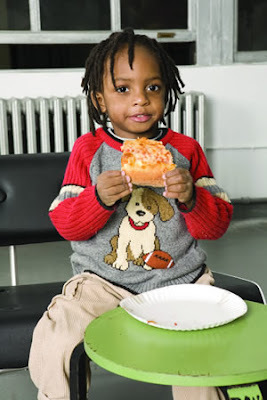 Weighty Matters: Do 3 Year Olds Really Need Pizza Day? Do 3 Year Olds Really Need Pizza Day? My 3 year old daughter goes to pre-school 3 half days a week. At the beginning of the year we received a letter from the school asking us for $45 to pay for her monthly pizza day. "What's Pizza Day? ", we asked ourselves. Well, pizza day is a day where the school orders pizza for the kids and serves them that along with pretzels, cookies, juice and carrot sticks. On pizza day we send our daughter to school with homemade pizza on a whole grain whole wheat pita, watered down juice in a sippy cup, yogurt and fruit. And guess what, she's young enough not to care; she's 3 and peer pressure and conformity haven't really hit her yet. I think the more important question to ask is, "Do 3 year olds really need pizza day?". It's not as if they're going to know any different. It's not as if they wouldn't be just as happy with fruit salad day, or pita and hummus day, or simply not having a special food day that at the age of 3 teaches them about the culinary rewards of junk food. After all, they're 3 and they're simply happy to be 3. Certainly if the kids were older and they had a concept that pizza days were in fact a possibility and something to look forward too I'd have an easier time with them (though I'd still have a tough time with the need for the pretzels, cookies and apple juice), but again I've got to reiterate, these kids are 3 - they're not quite forward thinkers yet. I'm embarrassed to say that I haven't gone to the school to talk to them about it. Many of our friends' children are in our daughter's class and many of them are happy about pizza day. For them it's a day where they don't have to pack a lunch and for some a day that they're pleased because at least their children will eat their lunch that day. I'm truly split about whether this is something worth bringing up with the school or just leaving it alone. Any thoughts out there? If I didn't have ethics, I'd be rich!